The automotive industry is changing rapidly these days thanks to the influx of computing poweer, and it will continue to consume considerably more CPU and GPU horsepower in the coming years. As a result, it is not surprising that IP and hardware developers are increasingly tailoring offerings for the automotive industry. To that end, Imagination Technologies on Tuesday introduced its PowerVR Automotive package of IP aimed specifically at solutions for various vehicles. In fact, PowerVR Automotive is more like an initiative that will expand over time to include more offerings. 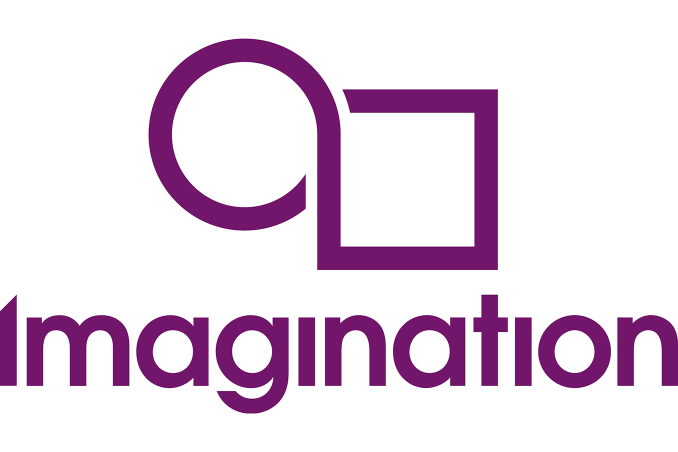 Imagination has been supplying various IP blocks for the automotive semiconductor industry for many years, so the company is clearly not a newbie here. Today, PowerVR IP — including 8XT high-performance GPU cores, energy-efficient 8XT/P GPU IP, and 2NX neural network accelerator IP — are used extensively for chips that power infotainment, digital cockpit, and advanced driver assistance systems (ADAS). 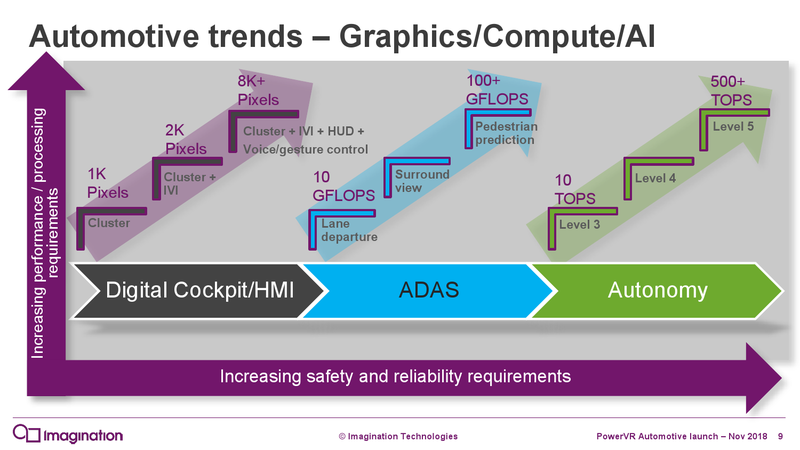 Meanwhile, as demands from developers of SoCs for auto applications are growing, Imagination is rolling out its new portfolio of IP featuring enhancements specifically aimed at the automotive industry. Imagination’s 2018 portfolio of PowerVR Automotive hardware IP includes the PowerVR 8XT-A GPU, which supports enhanced recovery and reliability features that are required by SoC designers to get automotive safety certification for processors aimed at digital human-machine interfaces (HMIs) and autonomous vehicles (AVs). In particular, SoCs featuring the 8XT-A GPU achieve ASIL-levels of functional safety, and can meet industry standards such as ISO 26262 as well as IEC 61506. The new GPU also supports hardware virtualization for QoS and security (i.e., all apps can run in isolated containers), ECC, and LBIST (logic built-in self-test). Meanwhile for those who need an ultimate reliability and do not care about the costs, the PowerVR 8XT-A even supports a dual GPU technology that enables to run workloads in lockstep. 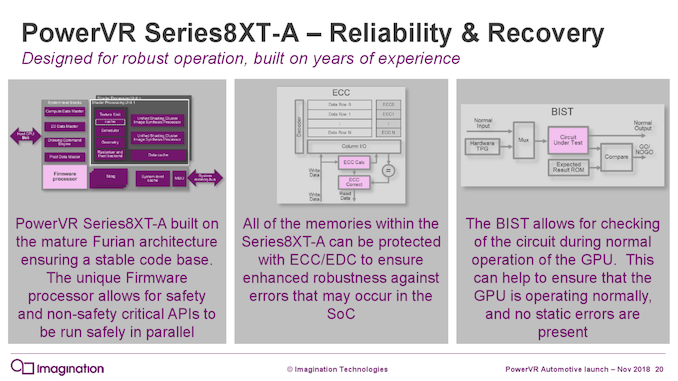 Besides enhancing the GPU on the logical level, Imagination claims that it also ensures that the IP is implemented using a process technology that is tailored for automotive applications too (so, think extended temperature ranges and other perks). 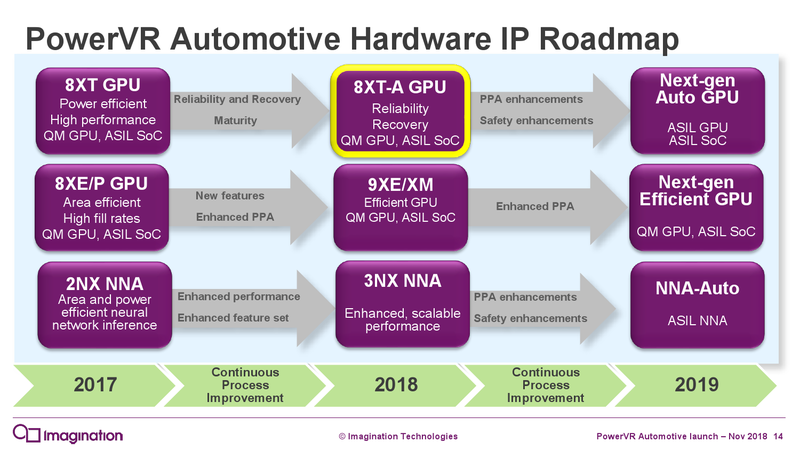 In addition to the PowerVR 8XT-A GPU, the 2018 automotive hardware IP portfolio from Imagination also includes the PowerVR 9XE/XM energy-efficient GPU, as well as the 3NX neural network accelerator. 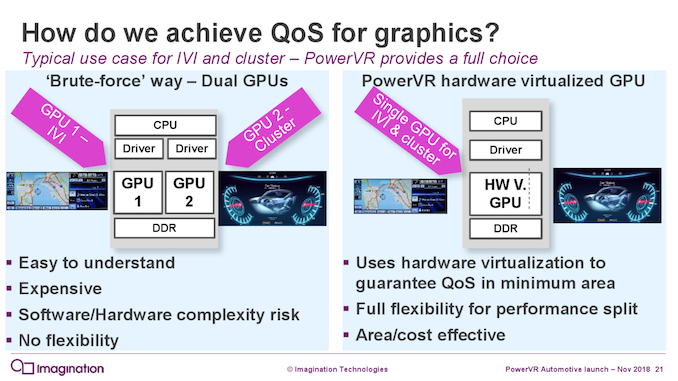 What is more important is that Imagination intends to continue to expand its PowerVR automotive hardware IP portfolio with tailored solutions. In addition to another automotive-grade GPU IP due next year, the company will offer an ASIL-capable NNA. Which in turn can be mixed and matched with the PowerVR 8XT-A GPU and other processing blocks. All of Imagination’s PowerVR Automotive IP is supported by appropriate APIs, hypervisors, operating systems, and so on. Therefore, a broad lineup of SoC developers as well as auto makers can take advantage of the new IP designed by Imagination. Nice to see Imagination is still working on good stuff, but they really need some design wins. Thank you for sharing this article. I really loved it. Keep sharing!! !